Gold was first discovered on the Fortymile River in 1886 in the vicinity of the Yukon-Alaska border. The discovery of gold on the Fortymile River led to the first major Yukon gold rush. In 1887, 115 miners were at work using picks shovels and rockers; using these hand tools they extracted more than 14,000 ounces of placer gold in that year. The town of Forty Mile, located at the confluence of the Fortymile and Yukon Rivers was established as a base for a productive and lucrative mining industry. Supplies were freighted in by steam boats from Seattle, travelling on the Pacific Ocean to the mouth of the Yukon River. From here they travelled 1,600 miles upstream on the Yukon River to the town of Fortymile. The village of Forty Mile had several thousand inhabitants at its peak. Initially, mining work was limited to the rich bar gravels, where several ounces of gold per cubic yards of gravel were skimmed off the top foot of gravel. These gravels were quickly; exhausted by the thousand of miners sometimes working shoulder to shoulder in the richest diggings. 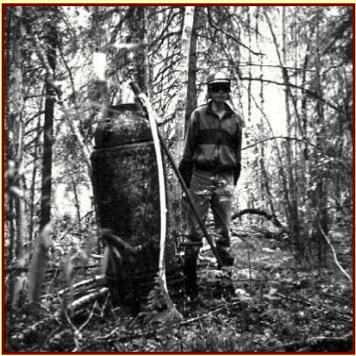 The Fortymile was the first location where shafts were thawed to bedrock in the permafrost gravels, to gain access to rich deposits of coarse gold laying on the bedrock gravel contact zone. Initially, fires were used to thaw the gravels, but this method was later replaced by steam. Steam thawing, driving pipes ejecting high pressure steam into the frozen gravel, made it easier to exploit these frozen gravel deposits. Miners continued to work the region for the next 10 years. In 1896 the Fortymile diggings were largely abandoned when gold was discovered a short distance away in the Klondike (the Klondike gold rush was the biggest and richest placer gold rush in history). Hence the rich gravels of the Fortymile were never completely exploited. Between 1908 and 1911, a small steam powered dredge worked a limited section of the Fortymile, 8 miles upriver from its mouth. Click here to see a copy of the original prospectus for this Fortymile River dredging venture. This dredge recovered over 8,000 ounces of gold before the project was halted due to the advent of the First World War. 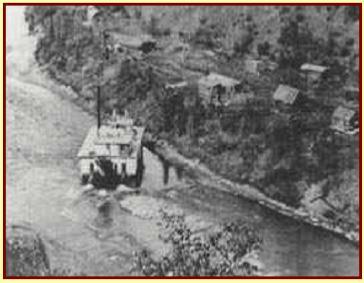 In 1934, another dredging operation was initiated at the mouth of Bruin Creek, however this venture was short lived because the dredge was destroyed by ice and high water the following spring. There have been several successful historic dredging operations on the Alaskan portion of the Fortymile river. However, only a small portion of the dredging reserves on the Canadian section of the river were mined. Despite the success of the early day mining activity on the Fortymile, the miners of that time barely scratched the surface of the vast reserves encompassed in this drainage. The primitive mining tools of the day limited the amount of gravel which could be processed. We have held the placer mining rights to most of the minable reserves on the Canadian portion of the Fortymile River since 1979. As well, we have substantial holding on the richest tributary creeks in the Canadian portion of the Fortymile drainage. Early day dredge operating in 1912 on the South Fork of the Fortymile River, located in Alaska. Remains of many of the early day dredges that worked the Fortymile River can still be seen along the banks. An old steam boiler which we found in Marten Creek. It was used to thaw gravel to bedrock depth by one of the many hand miners working in the area in the early days.